Vitamins and minerals are necessary nutrients; your organism requires to function properly. They represent itself as building blocks of health and to put in the bases for everything, that there is in our body, therefore a consumption of enough of vitamins and minerals, has paramount value. 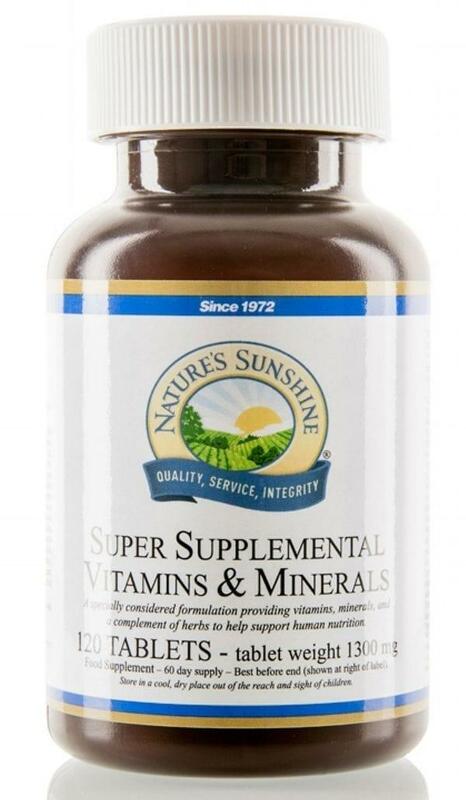 Super Supplementals formula has in its formula full range of necessary nutritious elements that provides 100% of recommended daily requirement of the majority of vitamins and a full set of the minerals necessary for health. It supplies an organism with microcells from superproducts and contains the important antioxidants lutein, lycopene and carotenoids which support tissues on all organism. Vitamins and minerals are necessary nutrients, your organism requires working properly, and the organism requires in regular daily delivery of vitamins and minerals for maintenance of healthy condition. Vitamins and minerals usually enter into our organism through food which we eat, but modern agriculture, pesticides and fertilizers are used for acceleration of process of growth has deprived the soil with necessary nutrients, and has in its turn led to an exhaustion of nutritional value of our crops. There are two types of vitamins your organism demands to survive, fat-soluble and water-soluble. Fat-soluble vitamins are basically in fat products, such as fats of an animal origin (including butter and lard), vegetable oil, dairy products, liver, oily fish. The organism can be a storage of fat-soluble vitamins in liver and a fatty tissues for use in the future. Fat-soluble vitamins contain vitamins A, D, E and K.
Water-soluble vitamins don't remain in an organism so your organism requires in regular daily provision. Water-soluble vitamins contain in fruit, vegetables and grain crops, but they may be destroyed under the influence of heat, under the influence of air and cooking. Thus, at preparation of our vegetables we lose many necessary vitamins with food. Water-soluble vitamins include vitamin B6, B12 and vitamin C, and also plus biotin, folic acid, niacin, pantothenic acid, riboflavin and thiamin. Minerals for strong bones and teeth are necessary for us, for the control of liquids inside and outside of the cells and to transform food which we eat into energy. The basic minerals contain calcium, iron, magnesium, phosphorus, potassium, sodium and sulphur. The best way to fulfill your diet is Super Supplemental Vitamins & Minerals. The balanced nutritious elements are often in shortage in our bodies during the moments of physical stress or recovery, or a diet consisting basically from the processed products. Many other components contain choline, inositol and PABA. And all of these is provided in a base of alfalfa herbage, asparagus powder, barley grass juice, broccoli powder, cabbage powder, hesperidin, lemon bioflavonoids, rutin, rose hips, wheat germ and kelp.